You’re engaged! Now, it’s time to plan the wedding of your dreams. 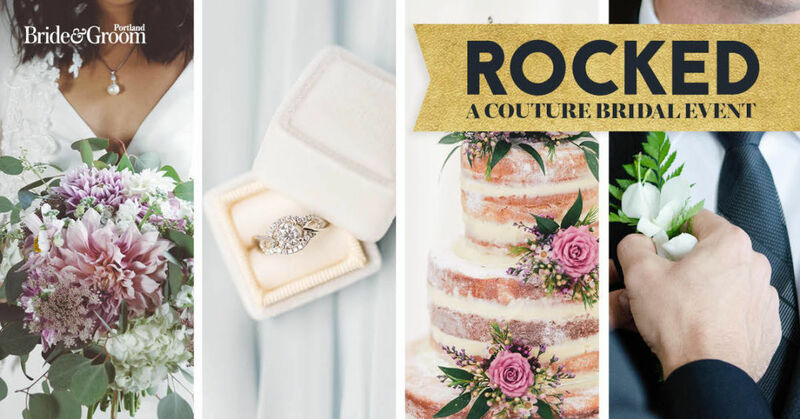 Join us Sunday, February 18, 2018, for an afternoon of bridal bliss and inspiration, when the pages of Portland Bride & Groom come to life at The Nines Luxury Hotel for our 7th annual Rocked, a couture bridal event. The sixth floor of The Nines Luxury Hotel will be transformed into a wedding wonderland when Portland’s best wedding-service providers connect with our readers, and brides and grooms to be. More than 700 guests are invited to meander through impeccably designed spaces and mingle with exhibitors that specialize in crafting elegant and picture-perfect weddings. The event will feature live fashion models, inspiring vignettes with creative themes, endless amounts of inspiration, contests, and of course, champagne. The celebration starts at noon and goes until 5 p.m., culminating in a toast for all engaged couples. Tickets are available online, and are priced at $20 for general admission and $30 for VIP access. Rocked VIPs receive veils, bow ties, and gift bags for the soirée.